Buddhist mudras offer an important complement to Buddhist meditation methods. 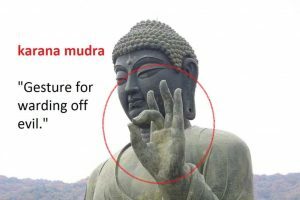 In my ultimate guide to mudras I revealed everything Buddhists need to know about the history, science, and background of mudras. Mudras are a way of training the mind and of healing the body. Buddhist mudras, however, are usually about training the mind in the ways of the Dharma. 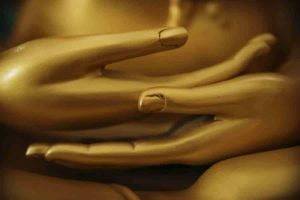 Let’s take a look at the top 7 Buddhist mudras. 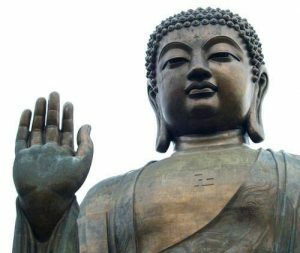 There are 7 essential Buddhist mudras that you need to know. These are the mudras that the Buddha taught and they are essential for all practicing Buddhists. Also read my guide to the best hand positions to boost health. Here on THE DAILY MEDITATION I previously wrote about how to earse fear from your mind. The Abhaya mudra (Fearless mudra) is a Buddhist way of removing fear from your mind. You would be infinite and limitless. You would be completely free. That’s what the Abhaya mudra is all about. It removes fear from the mind and replaces it with inner peace. Abhaya is a mudra with a very important meaning. The word Abhaya is Sanskrit for “Fearless.” This isn’t fear in the modern sense though. It’s fear that includes stress, anxieties, worries and so on. The gesture is ancient and has a clear body language meaning too. By showing that the hand is empty the individual shows friendship and peace. In the west the gesture could easily be confused with a Stop sign. And this is important. The gesture stops the pressures of the outside world from entering the mind. In Buddhism the Abhaya mudra shows the power of the Buddha or Bodhisattva and their fearlessness. 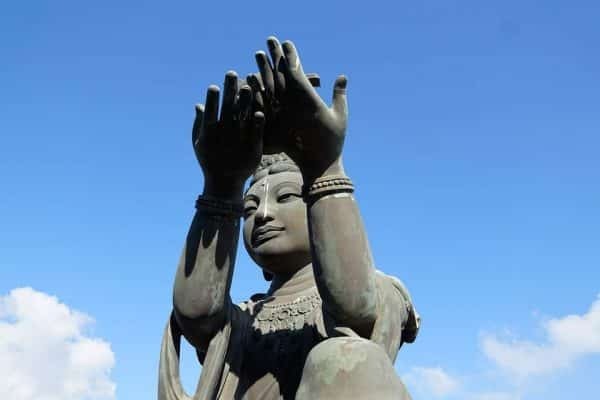 It is said that this is the gesture made by the Buddha after finding enlightenment. The Buddha used the gesture again when close to being attacked by an elephant. It is said that on seeing the gesture the animal calmed and ceased its attack. The mudra is the simplest mudra to use. To make the gesture, hold your hand at shoulder height with the palm facing outwards. The Abhaya mudra creates feeling of fearlessness and protection. It is a very empowering mudra which will stabalise individuals and create calm and security. Try the mudra now. Do you feel the power and fearlessness in your mind when you hold your hand in this position? Notice how powerful the mudra is? You can actually feel its effect within a few moments of doing it. Abhaya is a mudra we could all use more often. It is a powerful mudra that immediately grounds us and restores our power. The fearlessness this mudra produces is invaluable. Living with a fearless mind is essential for enlightenment. And it’s essential in everyday life too. The most successful and happiest people are those without fear. People like Buddha, Ghandi… they were fearless. And they made the impossible happen. Try combining the Abhaya mudra with these techniques for fearlessness. You will find the combination of the mudra and meditations is…. immense. In our guide to reaching enlightenment we reveal the stage you can go through to achieve this highest of states. The mudra for enlightenment is Bhumisparsha. The Bhumisparsha Mudra (Earth-Witness mudra) is one of the most important mudras in Buddhism. 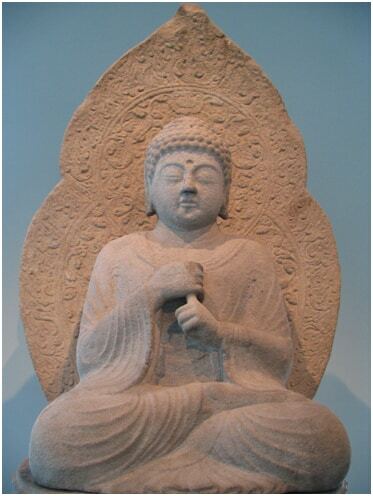 Buddha found enlightenment while he was using Budhimsparsha mudra (Earth-Touching mudra). One day, the Buddha, Siddartha Guatama, was sitting meditating by the Bodhi tree when he was attacked the the demon called Mara along with Mara’s monsters. 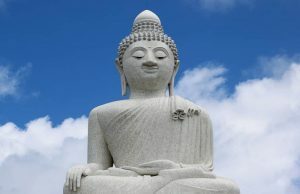 The attackers hoped to frighten Siddhartha Guatama (Buddha) from his place under the Bodhi tree. But Buddha remained unmoved. 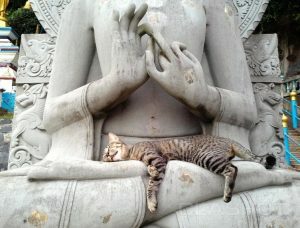 Mara claimed his spiritual successes to be greater than Buddha’s and took his place under the tree. “I am his witness” cried Mara’s monsters. “Who will speak for you?” said Mara to Siddhartha. Sidhartha reached his right hand down to touch the earth. It was then Siddhartha Guatama realised enlightenment. All Buddhist mudras have a specific meaning. The Bhumisparsha mudra (“Bhumi-sparsha”) literally means “Touch the Earth Gesture”. There is symbolism involved in the name too. It represents steadfastness, the Earth representing the grounding the Buddha needed in order to not be swayed by Mara. The left hands on the lap represents prajna (wisdom). I recommend you start by learning how to do Zen meditation. Close your eyes and meditate for a few moments. Now hold your left hand open palm up on your lap. Place your right hand over your leg so that your finger tip touch the earth. Meditate in this position for 30 minutes. Promotes meditation and makes it easier to focus when meditating. The left palm facing upwards is a very calming position. If you place both your hands upwards on your lap (try it now) you will notice that you feel more accepting and more relaxed. The fingers reaching down and touching the earth also help you to feel more grounded. For Buddhists, because this mudra is so symbolic of such an important time in the life of Buddha, the mudra makes you feel more connected to Buddha. What do you think about this mudra, and what does it mean to you? Dharmachakra Mudra can be translated to “Wheel of Dharma” from the original Sanskrit. This mudra is one of the most important of all Buddhist mudras. Hence its inclusion in our online meditation course. considered the moment that “Set the wheel in motion.” Hence why this mudra is called the Dharmachakra Mudra / Wheel of Dharma Mudra. You have probably seen Buddha statues in which Buddha is holding his hands in this position. So what does this mudra mean and how do you do it? Follow these instructions for the Dharmachakra Mudra, then meditate on the breath for 10 minutes while holding the gesture. Place the tip of the index finger of both hands on the tip of the thumb. Hold your hands up at heart level with the left hand in front of the right. Meditate in this position for ten minutes. Try it now. The Dhayana Mudra can be a single hand or double hand gesture. When used in the single hand style the left hand is placed on the lap in the Dhyana Mudra, while the right hand may be placed elsewhere. In this fashion the Mudra represents wisdom. Objects such as a singing bowl or text may be placed in the left hand. The double handed Dhyana Mudra has both hands place on the thighs or held at stomach height. The left hand is placed below the right, palms up, fingers extended. The thumbs may optionally be moved to touch each other lightly at the tips in order to form a mystic triangle. The mystic triangle represents the Three Jewels of Buddhism. There are three key reasons for using the Dhayana Mudra: focus on the Good Law, aid in meditation and heightening spirituality. In Buddhist training it is important to remove anger from the mind. Varada is Sanskrit for Favourable. Varada Mudra means “Favourable Gesture.” This mudra is shown in welcoming and evokes feelings of compassion, charity and honesty. The gesture is seen often on spiritual figures who are dedicated to freeing themselves from greed and anger and to contributing charitably to the good of others. 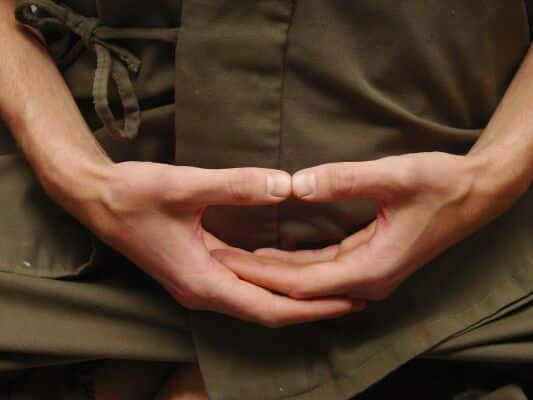 The Mudra technique can be performed with a crooked arm by turning one palm up into a giving position, or with the arm facing down and palm presented, the fingers being slightly bent. For more advanced instructions take a look at my guide to practicing mudras. It is the left hand that makes the Mudra, while the right hand adopts another mudra, most often the Abhaya Mudra. And what are the benefits of the Varada Mudra? The Varada Mudra opens our mind to compassion and love. It is an excellent mudra for freeing oneself from greed, anger and possessiveness. Vajra mudra is the Buddhist mudra for self confidence. This mudra is made by wrapping the fist of the right hand around the forefinger of the left hand. The tip of the right forefinger should tough the tip of the left forefinger. Vajra mudra is called the mudra of the six elements and the fist of wisdom. Vajroli mudra symbolises the five worldly elements (earth, water, fire, air, and metal) in harmony with the consciousness. This gesture belongs to an Esoteric Buddhist (Shingon) called Dainichi Nyorai (Vairochana). Vitarka is a great psychological / spiritual mudra. The Vitarka mudra is one of the Buddhist mudras that has fantastic psychoglogical benefits for the practitioner. Vitarka literally means “Discussion”. So this is a mudra that helps the mind to enter a more agreeable, friendly state. There are similar mudras such as the Dharmachara mudra, which is known to improve our connection to society. The Vitarka mudra is remarkably similar to the Abhaya mudra, which is the mudra for fearlessness. Hold the other fingers straight. This hand gesture has a massively important meaning. Its meaning is express through both the name and the hand position. So put together “Vitarka mudra” literally means ‘Gesture for discussion”. Put your hands in the mudra position using the steps above. Do you feel the energy between your thumb and forefinger? That energy stimulate the mind to increase our ability to learn. The palm is facing outwards as though welcoming the energy of the outside world. The other three fingers are held straight up, which stimulates energy in the fingers. If you hold this hand position you will actually feel a positive energy in the mind and you will feel calmer and more connected to the outside world? Can you feel that energy? It is a stimulating energy that encourages a positive mind. Let’s take a look at the benefits of this mudra. helps to prevent us from entering argumentative states of mind. When using the Mudra you will feel a calming energy that is useful for reducing internal conflict. Evokes a feeling of silent wisdom. Karana mudra is one of the best mudras for beating depression. The Karana mudra (otherwise called the “Gesture For Warding Off Evil”) is an easy way to stop anxiety, stress and depression. The Karana mudra is one of the Buddhist mudras. This potent little gem has been proven to boost happiness, inner calm, and relaxation. The Karana Mudra works by removing what Buddhists call “obstacles.” In other words, it helps us to overcome negativity. Obstacles include things like negative thoughts and feelings of unhappiness or anxiety. But karana mudra is not exclusively for people suffering from depression. Even the most enlightened people experience negative states of mind. Thankfully, we can turn negatives into positives. One way to master negativity is with the Karana mudra. Karana mudra helps us to remove negative energy. And it way can combine it with a mantra for negative energy. This will make it even more effective. So this is a mudra for everyone. It is a natural, spiritual way of removing the obstacles that get in the way of our inner peace. There are many ways to quieten the mind. When the mind is quiet we experience inner peace, serenity, and a deep sense of relaxation. But to quiet the mind we have to remove negativity. Just as we must clean the body, we must clean the mind too. In my experience, the karana mudra is one of the best ways to clean the mind of negativity so we can be positive. And the best part is that the karuna mudra is very easy to do. In order to make the Karana Mudra, simply touch the tip of the third finger to the tip of the thumb, and hold your remaining fingers upwards. You will notice that this is also the “Peace” gesture, and turned backwards it become the totally kickass “Rock on!” gesture. But this does not refer to “Evil” in the usual sense. It’s more about removing impurities and negatives from the mind. When we remove these obstacles, we get one step close to enlightenment. If you have ever tried Zen meditation technique you have probably used Cosmic mudra, the Zen mudra. And if you’ve never tried Zen meditation you might have seen monks sitting crossed-legged with their hands cupped together. What’s that all about? Well, the Cosmic mudras (Zen mudra) is a hand position that is used to create calm and focus when meditating. This is one of the most popular mudras that I shared in my list of 60 different mudras. Let’s take a look at how to do Cosmic mudra and what it’s used for. You might be surprised by some of the health benefits of Cosmic mudra! The good things about Cosmic mudra is that it’s, well, easy as pie to be honest. Some mudras are really hard. They involved interlocking your fingers at all different directions in order to activate the acupuncture points in the hands. Zen mudras is easy. Really easy. There are two main benefits of cosmic mudra in Zen meditation technique. The first benefit is that the Cosmic Mudra brings balance and harmony to your mind. The mudra actually means to move beyond duality. The cosmic mudra also helps you to keep focus. Because if your focus drifts your hand position will change and you will notice it. So, this serves as a notice saying, “You’re losing focus. Concentrate’. 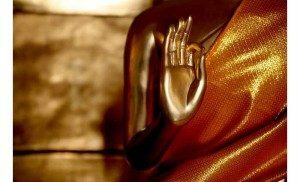 These Buddhist mudras are powerful ways of training the mind. Best practice is to add these to your Buddhist meditation plan. 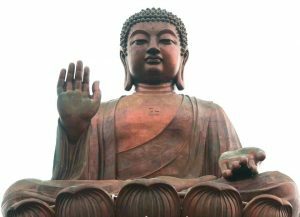 Note that, because of the symbolism of these mudras, you should also consider Buddha’s hand positions when it comes to choosing your Buddha statue. thanks! this was a helpful post 🙂 I enjoyed trying out the different mudras and feeling their instant benefits! Hi Tana; thanks for your comment. I’m happy you enjoyed the article. Have you found the mudras useful?